Surprise, surprise! The retail move from straight brick-and-mortar to an omnichannel BOPIS (buy online, pickup in store) strategy paid off in a big way for the major retailers. The biggest winners were Target and Walmart, where 71% went to get gifts, while 40% went to traditional department stores and 24% to dollar/variety stores, according to ICSC. Click-and-collect services, such as Walmart’s Pickup Today program, were key to the success of the holiday sales, as 86% of the shoppers bought something additional to the items that they ordered online while picking up the online orders. Though “click-and-collect” has been around for a while with many retailers, the major retailers spent plenty on awareness campaigns. Adobe Analytics found that click-and-collect grew 47% this past holiday season, the biggest BOPIS year on record and the result of retailers’ making it possible (and easier) for shoppers to come in for their online orders. How did your company do this holiday season? Did you see a bump in holiday sales due to omnichannel strategy? Sound off in the comments! Let us bring all of the relevant Walmart Supplier News to your inbox. Register for our weekly newsletter, sit back, and stay in the know! Yes, I would like to receive Walmart News. Sign me up! 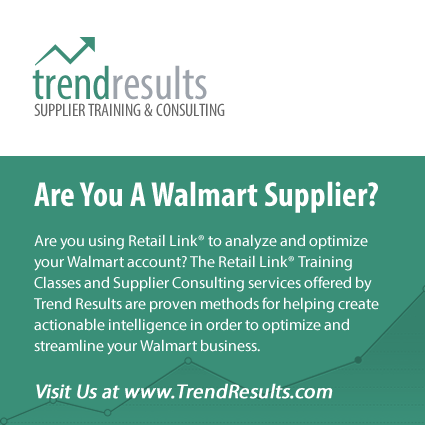 Trend Results and Walmart News Online are in no way associated with or endorsed by Wal-Mart Stores, Inc. All references to Wal-Mart Stores, Inc. trademarks and brands are used in strict accordance with the Fair Use Doctrine and are not intended to imply any affiliation of Trend Results or Walmart News Online with Wal-Mart Stores, Inc. Retail Link is a registered trademark of Wal-Mart Stores, Inc.